With hundreds of thousands of bad compilation albums out there, it’s easy to forget that there are some good ones too. I suppose the advent of iTunes and shuffle buttons mean that fewer people care about listening to tracks in the sequence the artist intended them to be heard – and certainly a lot of compilations are thrown together, seemingly at random. 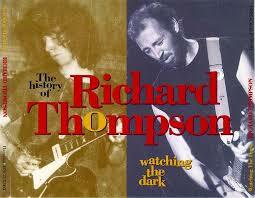 This one is an exception: A triple-CD collection of tracks recorded by Richard Thompson between 1969 and 1992. It was compiled (actually, I’d prefer to say curated) by long-time Thompson enthusiast Edward Haber and issued in 1993 on Hannibal Records (HNCD 5303), the label set up by Joe Boyd who had produced many of Thompson’s finest recordings over that period. It was also pulled together with the artist’s full involvement. In more recent years Thompson has been the subject of two substantive box sets. (Plus a double album anthology of his period with Capitol Records (Action Packed)). There’s RT: The Life and Music of Richard Thompson, a mammoth 5 CD + book collection produced by Free Reed in 2006 and a 4 CD retrospective, Walking on a Wire put out by Shout! Factory in 2009) but this was the first real anthology (although Island records issued a double album of live tracks and rarities in 1976 when Thompson had left the music business for a while to live in an Islamic commune). Listening to this again though, I think it may be the best of the whole bunch. The first thing to note about Watching the Dark is what good value it is. Each of the three discs contains more than 70 minutes of music and of the 47 tracks, only half (24 if you’re pedantic) were available at the time of issue. The remainder are a mixture of live versions of songs, re-mixes, wholly unreleased or unavailable material. The package also includes a carefully compiled and expensively-produced colour booklet. While not including song lyrics this does provide details of the source of each recording (studio or venue) and every musician plus a thoughtful essay on Richard Thompson’s career to the date this collection appeared. The next thing to note is how the project is sequenced – which us unusual but works surprisingly well. Instead of attempting to ‘theme’ the material or simply present it chronologically, Haber groups the tracks into two or three year periods (1978-80, 1972-73 and so on) but then spreads it about (so three tracks from Thompson’s Fairport Convention period are in the middle of disc 1 while three from his first solo album are on disc three while the five most recent songs of all are in the middle of disc 2. I can’t work out why this works so well – but it does! Another thing I found impressive was that Haber didn’t feel the need to represent all of Richard Thompson’s side projects. This means that although the French, Frith, Kaiser, Thompson collaboration is featured (‘Bird in God’s Garden/Lost and Found’) there’s nothing from other ensemble albums like Morris On, Rock On or Saturday Rolling Around. Finally, there’s the music. The five LP’s worth of songs recorded with his former wife Linda Thompson form fifteen of the tracks here – and for me they’re among the most outstanding (‘Withered and Died’ and ‘Strange Affair’ are certainly in my top-ten Richard and Linda favourites! Interesting too are three songs which were released on the Shoot Out The Lights album (‘For Shame of Doing Wrong’, ‘Backstreet Slide’ and ‘The Wrong Heartbeat’) but which are represented here in earlier versions produced by Gerry Rafferty and Hugh Murphy for an album which Richard Thompson vetoed because he hated the production. I think they’re rather good though, although the sound is rather ‘lusher’ than I would have associated with Thompson at this time. Also well-represented are live tracks from the Richard Thompson Big Band which, for a while, included Clive Gregson and Christine Collister (who were making their own albums as a duo around this time). A later female vocalist who was part of the band for a while and who is represented here is Shawn Colvin. Others featured include Pete Zorn, John Kirkpatrick, Simon Nicol as well as past and present Fairport Convention drummers Dave Mattacks and Gerry Conway. In the mix too are some solo performances – including a handful of acoustic guitar versions of traditional tunes. All in all, it’s a really impressive collection and worth commending. Although it’s not cheap, even on Amazon, it shows that decent compilations are worth buying if they’ve been compiled with care and attention to detail (unlike those which appear without even crediting the artists, producers and engineers whose work is represented).